Florence + The Machine are known for bringing something a little different to both the British alternative scene and global charts. Singer Florence Welch’s unbelievable range and ability to make any listener empathise with her using solely the power of her voice has made her not just a leader of the pack, but a bona fide superstar in her own right. Debut album Lungs could be argued to be a modern classic, with singles like Dog Days Are Over and You’ve Got The Love earning them a vast army of fans. 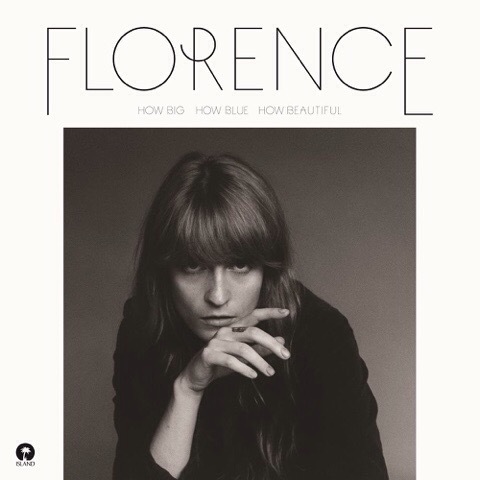 New release How Big, How Blue, How Beautiful, their first in almost four years, is noticeably different to the aforementioned Lungs and 2011’s Ceremonials. While these first two albums are filled to the brim with aurally interesting tracks instantly drawing you in, How Big… is a stark contrast, with slow, plodding songs at the forefront. Things start off well with singles Ship To Wreck and What Kind Of Man. Both are different to each other, and you’d be forgiven for thinking the former is from Lungs. Upbeat with a link to water in the title (a theme that lyrically tied a lot of Ceremonials together), Ship To Wreck seemingly tries to bridge the gap between the old and new Florence. Welch’s vocals cannot be faulted as she sings about overindulgence of drinking, a topic visited heavily in her past work. What Kind Of Man is a contrast, with an ethereal intro being interrupted by heavy power chords, unexpectedly transforming the song into an epic, ballsy number, showcasing almost aggressive vocals from Florence and the brass instruments set to feature heavily on the rest of the album. While the album opening sets expectations for the remainder high, a lot of How Big… leaves a lot to be desired. The title track starts off promisingly, with Welch’s voice looping and soaring over a beautiful range of trumpets, clarinets and horns. However, the last minute and a half sees the brass completely overtake the song, causing the prior three minutes to be sadly forgotten. Various Storms & Saints and St Jude almost kill the momentum stone dead due to both having a distinct lack of beat and refusal to develop, with both ending up in the same place they started. Caught is completely forgettable due to surprisingly unspectacular vocals and an almost twee musical texture. That’s not to say that there aren’t moments of magic on How Big…, however. Delilah is a gospel choir’s dream and almost impossible not to sing or dance along to – when it gets going, that is. Long & Lost is a beautiful ballad, and the only one on this album which actually works, featuring Welch sounding vulnerable and almost childlike over an electric guitar and drums as she opens up about a fractured relationship. The biggest surprise comes in the form of album closer Mother, a full-on ’80s rock masterpiece where Florence truly gets to have the diva moment she didn’t quite have in What Kind Of Man. It’s refreshing, original and possibly one of the best songs Florence + The Machine have ever released. It is clear that How Big, How Blue, How Beautiful is influenced by past icons. Third Eye could fit right into Fleetwood Mac’s back catalogue and the aforementioned Mother could have been sung by Janis Joplin. Florence’s voice is as stunning as ever, and the new brass and guitars incorporated really work on the better songs. But it’s the slow and boring songs that make this album disappointing. They cause the tracklist to be disjointed and ultimately listening to How Big… not as enjoyable as one would like. Although this album may not propel Florence + The Machine’s star as much as they’d hope, it is still a very true statement that there is no one in music right now quite like them.